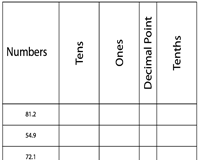 Introduce students of Grade 5 to terms used to describe place values for decimals, like tenths, hundredths, etc with this series of worksheets. 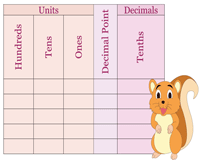 Laminate our color-coded collection of place value charts to help them distinguish the various place values of decimals up to millionths. Download and customize our templates according to your convenience. Our splendid color-coded place value charts up to millionths assists students distinguish whole numbers from decimals. Click on the 'Grab 'em All' option to download these blank charts that are available in both color and monochrome. 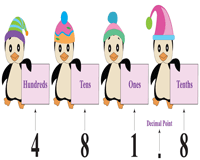 Review a student's comprehension on place value decimals from tenths up to millionths. 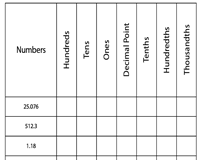 Use this print-ready worksheets to strengthen knowledge in place value of decimals. Separate downloads for tenths up to thousandths place values offers abundant practice. Read each decimal number and place them in the appropriate place value boxes. This assortment of printable charts serves a perfect assessment tool for teachers and home tutors alike. 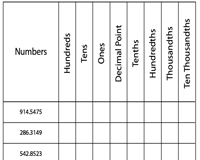 Employ these worksheets to enhance students perception in identifying place values for decimal numbers varying from ten thousandths to millionths place. Use the answer key to verify your responses. 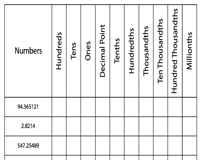 Assess your child's mastery in determining the place value of decimals ranging from tenths up to millionths place with this array of worksheets. Click on the download option for the complete set of charts.